8/13 Today is our last day of our Taiwan short term mission. We took place a combined showcase for all our 5 English Camps in Da-Chia. There are over 300 students and 20 parents come. 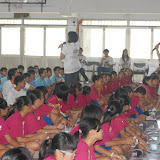 We are so surprised that they perform unexpected well English skill by singing, dancing and reading. And many kids use English to express appreciation to our teachers. We are so excited and with full of thanks to our God. After this showcase, we completed our short term mission. We have a follow-up plan for Huei Ming VBS, We have partnership with 3 Taiwan churches to have reunion activities in next 3 quarters in this coming year. Thanks God, we have over 500 persons accept Jesus. We feel God open more wider door here and soft people's heart in this year. Though we don't really know whether there are any Christians who raised their hand in our calling or any of them have raised their hand in past year before. Anyhow, we believe Jesus's name have been glorified. Thank you for praying and fighting with us in this spiritual war. 08/12 Today is the last day of VBS and English/Character camps. Praise the Lord! We have seen God’s abundant blessing in this ministry. We serve around 1000 people (including adults and kids), more than 500 persons accept Jesus as their savior, Glory to Lord! After a week long of friendship, our youth and school's students have built a very strong bond. It’s sad that we had to end this relationship so soon. Many students want us to come back next year. All schools’ principals have shown their appreciation by giving many presents to our teachers. 日南中學 vice-principal even asks us to come back for the next five years. We pray that we have left the strong message, to all students, that Jesus is the true Savior, and he will give all who believe in Him an eternal life. Praise the Lord! Tonight’s VBS was a hit. The silent show ‘Redeemer’ delivers a very powerful message and received lots of applause. Teachers from both parent groups used this last chance to deliver gospel in their presentation. In group A, 3 parents answered the gospel calling and many requested information about local church. ‘Undersea World’ was the theme of today’s Center Piece. It’s so beutiful that it seems that everyone wants to capture every piece of it. Principal Lai delivered a very powerful message. We deeply believe this is a life-changing experience for many kids. The coming Sunday will be lunar calendar’s July 15th, the day that hell closes it's door to the wondering ghosts according to the local idol worship. When ghosts return to hell, they take with them those people who are careless or show no respect to the idol. Many people worship the idol due to fear of revenge. The evil power has a very stronghold in Dai-jar. During this trip, we noticed that many people were touched by gospel, but they don’t want to be a Christian just because of fear. We ask your continue prayer toward those group of people. Pray that God releases their fear and encourages them to make the right choice. 08/11 Wow! Time really flies. We have only two days left for this trip. Praise the Lord and thanks for your prayer. We still experience God's presence and blessing everywhere we go. This morning we had a chance to talk about gospel to principal and director of 西岐國小. They really appreciate our support to their drama team. We also had a chance to see the drama presentation. The performance is amazing. Kids from 西岐國小 are doing a wonderful job. Please continue praying for their competition to be held in September and, of course, their spiritual growth (they are all Christians now). In日南Middle School, our kids and students are really getting along. Their English drastically improved. We started talking about the gospel today. Praise the Lord! We had over 30 kids show their willingness to accept the gospel. Your continuous prayer is greatly appreciated and urgently needed. Our VBS is always a success. The kids had a wonderful time. Huei-Ming worship team is amazing. No one can believe they are blind kids. God is really fair and these kids show a lot of talent in music. We also did an alter call and lots of kids showed their willingness to accept Jesus as their savior. Thank God for His amazing work. Tonight's Center Piece is an all-vegetable decorated Calvary, where Jesus crucified on the cross. Thanks for the nice work of Benjamin Lee. Please pray to God to give us wisdom and resource for the follow-up work. We praise God for His amazing work during this mission trip. However, it means that the follow-up work will be overwhelming. Please pray for Pastor Liu of 日南 Church. She is a wonderful pastor, but she does need more equipped helpers. We will try to have a calling for our 2 largest camps tomorrow (8/11)- Huei Ming VBS(210 persons) and Rih-Nan Middle School (370 persons). We all wish them can accept Jesus before we leave. We need your urgent pray to let God touch their life and we can be strong to share gospel. 8/10 Praise the Lord! Fourteen members from EFC 新竹台福教會 joined us today. Over all, the following churches are participating in this ministry: FEC SGV, FEC Cerritos, 台北行道會，篤行教會，新竹台福教會，豐富教會，曰南教會. Hallelujah! It's so great to have many congregations set aside their differences and join together, we can really make a difference. May God bless this ministry and bless those who we serve. It's hot and humid in Taiwan. There is no way we can dry our team T-shirt over night and we only have 2 T-shirts per person. This morning one brother murmured that it was hard to put on the still wet T-shirt. Another brother encouraged, "That's ok, It will be wet in 10 minutes any way." What team spirit! This trip is not easy, but when we see the harvest, no hardship is unbearable. Lord, may you increase. 8/9 Praise the Lord! We had a wonderful day again today. Even though today is the second day of the 5-day camp and VBS, our kids are still enthusiastic about their work. Some kids stayed up to almost 1:00 AM. However, their endeavor received the best reward. Kids from Rie-nan High School have changed their attitude toward our kids. They showed their interest on English and responded more during the class discussion. During our visitation, many people accepted Jesus as their Savior. Many co-workers who were here in previous mission trips stated that the field is very soft compare to last year. Thank God for His abundant blessing. Tonight's VBS is again a blessing. More kids came to the worship and bible discovery. Snack is well accepted as usual. The decoration received many "WOW"s.
8/8 is father's day in Taiwan. We started all our activities in 5 different schools in the morning and have a VBS at night. In all 750 students and 70 parents, God guides us to share gospel with many interesting ways, including lectures, worship, skit...etc. We also visit around 10 families. Thanks God, there are about 21 persons accept Jesus today. On 8/7, we went to the Abundance Church to worship God. Our youth was invited to perform the mime, the Redeemer, in their worship services. Their performance won wonderful feedback from the church members and newcomers. Praise the Lord for our very talented young people!! Pastor Kuo from the local church had lunch with some of our co-workers and they discussed the possibilities of future collaboration between the two churches. Stephen Tzeng shared a great message in a workshop at Tu-Shing Presbyterian Church this afternoon. Praise the Lord!! Both Tu-Shing Church and Abundance Church have gladly agreed to support the follow up to the 200 some children who will be attending the VBS. They plan to have quarterly meetings to gather the children at Hue-Ming School to provide more teaching and activities to enhance their walk with God. Pastor Rue-Chun Wong joined the short term mission team this afternoon. She will be supporting us in the next 5 days and helping us discern the future of our Taiwan short term ministry. 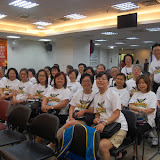 8/6 STM had a Marrage Workshop at Fong-Fu Church. There are 50 more brothers/sisters comes to learn topics about family intimacy. Almost everyone has very positive feedback and, at the end, there are 8 couples have re-vow their marriage vow again in front of the Lord. In addition, there is another team to visit our brothers/sisters' family at Chi-Yi county. They comfort their family members and have a very warm time. 8/5 We STM went to Da-Chia area to have prayer walk. We went to all the schools to get to know the environment and to get to know the principals and directors of each school. In the afternoon, during our prison ministry, out of the 264 prisoners, around half of them committed their lives to Jesus. At night, Stephen Tseng, preached in a church in Taichung, fifty members of the church recommitted their lives to God to serve Him. Another team went to visit the parents of Wei-Hong (a member from FECSGV). Despite all the fruitful results, we encountered much spiritual warfare today as well. Three people bumped their heads which caused some discomfort. Half of the couple thousand popsicle that we bought for the students of the schools melted because the freezer door was not closed properly. We need your continuous prayer to fight this spiritual battle everyday!! 8/3 Rev. Joshua visited some brothers' and sisters' relatives in Taipei, and lead Jerry's sister in law to accept Jesus. Thanks God. 8/4 All US members peacefully arrived Huei-Ming School - our base station at Taiwan. In addition to unpack all group luggage and prepare decoration items, we send a team Rih-Nan church to share gospel to their society choir (almost 2/3 are unbelivers). Thanks god, finally, there is one new friend accept Jesus. Taiwan STM departed to Taiwan in these 2 days, carrying over 25 luggage and boxes of VBS materials, gifts and decoration items (Pandas). Please pray for our safety and have good rest on the plane. By weather forecast, there is a typhoon approaching Taiwan in next few days. Please urge pray for good weather for us. Ann Lee has preached one of her relatives accepting Jesus. Praise the Lord. We appreciate your pray and supporting in past months. Your encouragement and pray indeed mean to us. We have a 40-days fasting and prayer board at church yard, please sign on at your preferred time-slot on next Sunday. With your prayer, we can fight this spiritual war with more confidence and power. This Friday night 7/8, we team will serve our "fund raising dinner" last time, but with FREE of charge. It’s Taiwanese style 肉燥飯 to appreciated every one participation for fund raising. Please come early for dinner! We only prepare 50 set of dinner. In last month, by God's grace, we will continue look forward to fundraising last $11000. Please also keep this in your prayer.